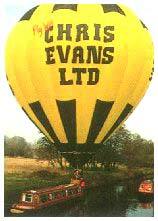 Adventure Balloons first took to the skies in April 1985, at a time when few other companies offered UK balloon flights. 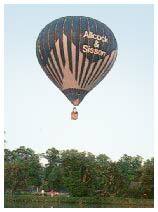 Demand for our hot air balloon flights grew rapidly and by 1988 we purchased a four passenger balloon, to be followed by several others. As the largest company in the country offering UK balloon flights, we now operate seven hot air balloons with capacities which range from four to sixteen people. 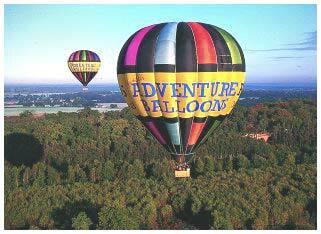 These include our eight passenger balloon, aptly nicknamed the "Stained Glass Window", and felt by many to be so attractive that we have used its design for the Adventure Balloons emblem and mugs, T-shirts and other balloon flight memorabilia. The "North Sea Flyer", our sixteen person balloon, has another story to tell. We bought it from two millionaires who flew across the North Sea for fun! It was the first hot air balloon of this carrying capacity the Civil Aviation Authority actually allowed to fly in the UK. As demand for our UK balloon flights has increased, we have worked closely with balloon manufacturers to develop new ideas to improve both the enjoyment and the safety to passenger balloon flights. 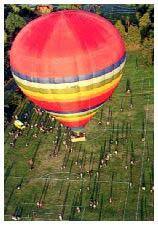 Larger hot air balloons, for example, have internal partitions which not only separate the pilot and the fuel from the passengers but also ensure that you are in the best safety position for landing. From early on it also quickly became apparent that we would have to offer the enjoyment of balloon flights from further afield than our original base at Hartley Wintney, in Hampshire. That's why you can now take hot air balloon flights from several locations in Hertfordshire, Berkshire, Surrey, Oxford and London.